Weaving is, by nature, a linear process. Whether in small areas, or across the entire width of the fabric the cloth builds line by line, in an additive fashion. It seems appropriate, therefore, or perhaps even inevitable, that weft stripes occur in textiles from all cultures. 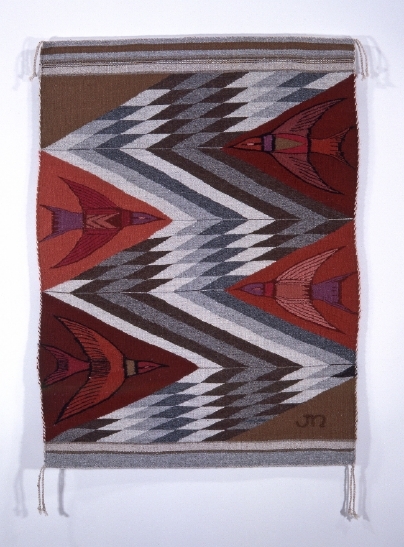 They are quintessentially “texture,” one of the universal, graphic components of the language of weaving. 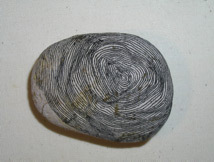 It might come as no surprise that a thoughtful artist, one who has been concerned with the nature of her chosen medium and the implications of that medium’s qualities and properties for her own creative path, might become interested in stripes, might even develop a creative conversation in which lines and stripes become a leitmotif, a subtext of the work. It is through this lens what I wish to consider the relationship between the different forms of expression within Christine Laffer’s artistic oeuvre. 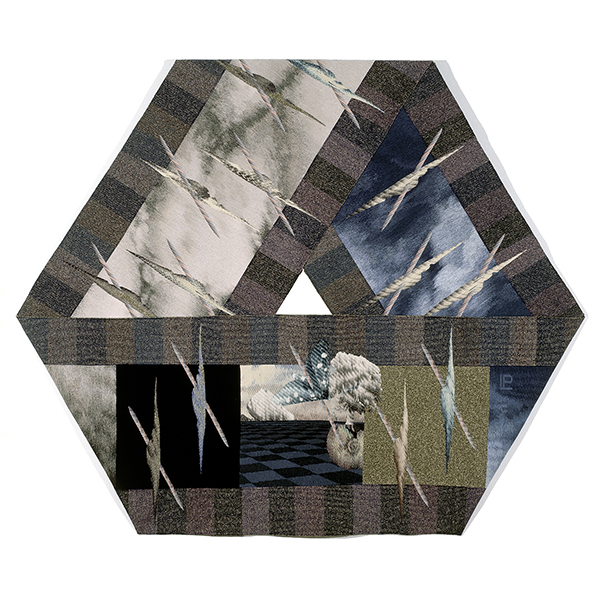 Christine began weaving tapestry after pursuing studies in architecture, another field in which the product arises out of building in an additive fashion with a set of forms that are bound into conversation with the vertical forces of gravity and the horizontal nature of the ground. The corresponding grid in weaving is, of course, the warp and weft. Beginning with the tapestry Red Escape, but developed in a more methodical manner in Pilowry, Christine has employed stripes of varying thicknesses to both ornament and define shape. Running horizontally, vertically, diagonally, and following the bulging and undulating forms of airing bedding and a shadowed figure, these stripes not only describe the various elements in the image, they also create an undercurrent, a secondary conversation that the artist engages with her medium, in which the decorative potential of geometric patterning that seems to arise so naturally from the grid of woven cloth meets storytelling, meets narrative. Stripes are, in Pillowry, both the medium and the message. They are the technique that defines the architectural shapes and creates the illusion of three dimensions in the cloth and the figure. They are also a form of ornamentation that has its own raison d’etre. 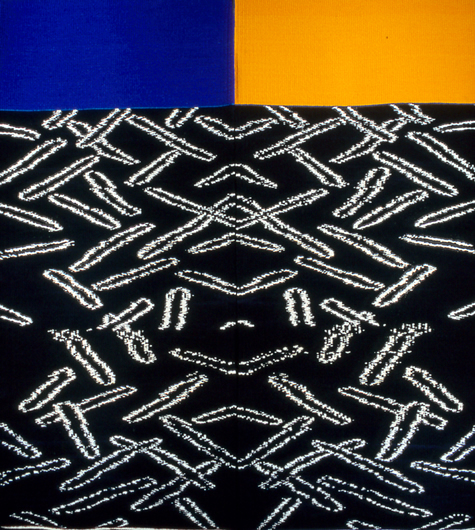 In 1990 Christine began experimenting with eccentric weave and the resulting forces that push and pull the tapestry out of its flat plane into an undulating topography more suggestive of cloth as a covering than cloth as a passive substrate for image making. 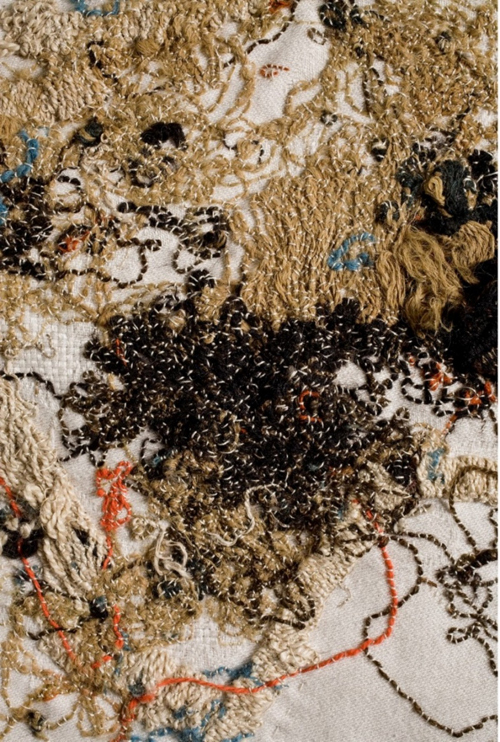 The textile’s properties as an object, its physicality, began to assert themselves as one of the subjects of the tapestry. Fabric bucklets, it bends, it hangs. It has weight, and volume. “Working with this physicality, and the unruliness of a technical variation that I call bas-relief or eccentric tapestry, I can play between the illusion of an image and the actuality of the object.” Within this paradigm of thinking the line between the subject and the object began to dissolve. White Sac is a monochromatic rendering of a torso in profile. The cloth, like the sagging skin it represents, folds and puckers. The three dimensionality of the tapestry and the image embedded within the cloth are reinforced through shading techniques based on the classical color blending systems of historical French and Flemish tapestries called hachure and battage. These rhythmic and structured systems create intermediate values through the alteration of light and dark stripes and elongated triangles. They are related to the mark making associated with engraving, although, unlike the marks in engraving, which travel in any direction and even cross each other, the woven stripes in this piece are confined to running parallel to the direction of the west. 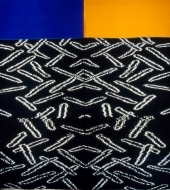 However, because the weft in White Sac is running eccentrically throughout the piece, the lines of the color blending techniques also follow divergent paths. The thin woven stripes, for the most part, reinforce the volumetric folds of the pilable cloth skin that, like our own flesh, has an incredible capacity to transform itself in order to accommodate an ever-changing body. The sensuality of cloth invites touch – our skin touching woven skin. However, this representation of flesh raises questions about the cultural attitudes towards sensuality and beauty. This flesh droops and hangs. Ruptures in the skin, created by gaping, elongated slits, suggest the eventual breakdown of our body’s covering and the dangling warp ends insinuate the leakage of bodily fluid. This sagging and imperfect sac evokes mortality and disintergration, rather than health and vitality. As viewers, our emotional response to this troubled body reflects the interrelationship between mental and bodily states. How are we to feel about this body? How are we to feel about our reactions to this body? In Collapse, the woven marks, the now familiar vocabulary of thin stripes, has been freed from following the path of the weft. Diagonal lines cross each other, creating patterns of cross-hatching. They evoke the fine lines that mark the surface of aging skin and symbolize the accumulated weight of personal experience. The convoluted puckering of the surface of the head created through the eccentrically woven weft and reinforced through the complex system of lines and cross hatching that create highlights and shadows, suggests not so much the relatively smooth casing of the skull, as it does the intricate and complex surface and nature of the brain itself. The black warp running behind the head produces shadows in the openings left for the ear and eye. It cascades out of the mouth and neck of the severed head.. No longer a taut, rigid support structure, its limp, disordered state contrasts with the rational logical thinking normally associated with the mind. The contents of this mind spill out in a profusion of tangles that bear little resemblance to the structure of the language. The metaphors of inner and outer, of structure and function, of order and disorder resonate throughout the image, the materials and the woven structure. In addition to her work in tapestry, Christine has recently begun a series of drawings on rocks, wood, bone and other found materials. 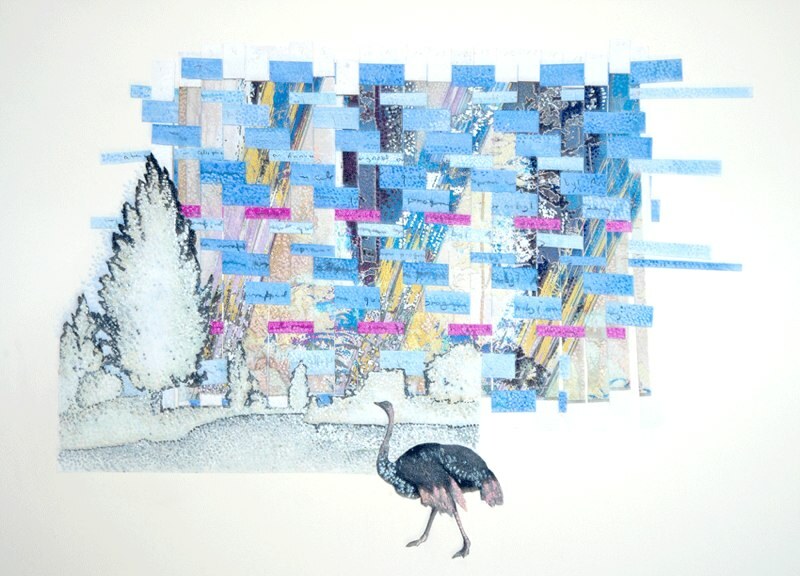 These pieces build upon the vocabulary of ideas and image making found in her tapestries but they also pursue additional lines of investigation. Working with found materials involves a certain collaboration with both chance (what will I find?) and with the found object itself, which comes with its own physical reality and history. Artwork made with the found objects has layers of meaning – its own, the artist’s and the meaning that arises out of the interaction between the two. As fragments they are also imbued with a certain melancholy, a sense of loss that comes with the passage of time and the loss of wholeness. In 10305 Christine has drawn a network of lines over the surface of a shell fragment. The shell possesses its own three-dimensional shape and its own series of radiating lines that mark the growth of the once living organism, an accumulative pattern of growth reminiscent of the build up of weft in a tapestry. The drawn lines, whose path if often broken by the slight depression of the shell’s growth rings, create the illusion of a series of folds that, in turn, suggest the corpus of Christine’s textile work and her use of lines and stripes to produce the appearance of cloth molding itself over the body or of the body itself. But the drawn lines also look like a miniaturization of the patterns on sand created by water and wind, or of the striations in rocks caused by the movement of glaciers. They suggest mountain ranges, sand dunes and flowing rivers. The repetitive nature of the parallel drawn lines also alludes to the endless pounding of surf that broke down this shell and to the continuous flow of water and movement of air, the forces of nature that create the landforms and the patterns that these drawings suggest. This small fragment, through the skill and artifice of the artist, through illusion and allusion, has acquired an extraordinary evocative power. It has become a portal for our imagination. The increasing density and complexity of the drawn lines in 30401 and 30405 respond to the irregular surface of the rocks. The miniature landscape they create calls to mind topographic maps and fingerprints. In 30406 the lines moves at various angles to each other, suggesting mountain ranges with rivers flowing in the valleys, or perhaps details from drawings of draped and folded fabric. The drawings on bone, 20304, evoke not only landscapes, or the patterns of wind and water on the landscape, but also sinew and the fibers of muscle. These works are small, close, intimate. In order to view the drawings in all of their intricacy one must hold them, turning them round and round, much as the artist, rock in one hand, pen in the other, cradled the rock as she drew over its weathered surface. The drawings are governed, to some extent, by the erosional history of the rock itself, and to some extent, by the intent of the artist. This is not a clean sheet of paper or a tightly stretched warp with all their implications of unbounded opportunities. These drawings respond to a set of givens that are part and parcel of the found object itself. Perhaps because of this interaction between the object and its history, and the intentions of the artist, these sensitive works evoke a diverse range of associations for the viewer. Through the drawings, additional layers of meaning accumulate, multiplying the rock’s metaphoric capacity. Successful small works possess a focused and powerful energy that is a product of concentrating meaning within a small space, and meticulous labor. Their intensity pulls the viewer near. Such quiet and unpretentious statements require close observation; they must be brought into our personal space. The conflation of the space between object and the viewer pulls us out of the present and into a more introspective, or contemplative mode, a state of reverie that is more receptive to the unexpected, or counter intuitive. In this liminal space of consciousness, associations float more freely, the mind is left to drift in the realm of possibilities. For some, this is the definition of art.